Western Greyhound have acquired a batch of Dennis Darts to replace Mercedes Varios. 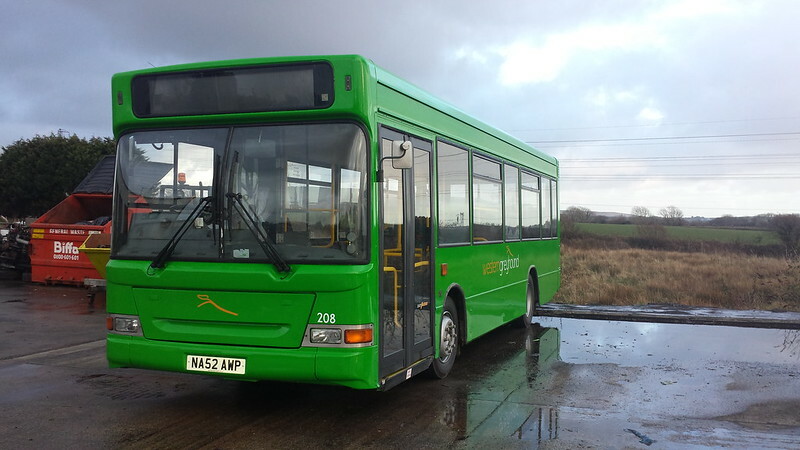 The first to receive the new standard livery is 208 NA52AWP which looks very smart indeed. Thanks to Mark Howarth for the photo. Network Rail denies Dawlish plan NETWORK RAIL has denied reports that it has chosen another rail route through Devon, avoiding the vulnerable coastal stretch through Dawlish. Damage to the Great Western Main Line caused by storms in south Devon will take some time to repair. Network Rail now says the link is unlikely to be restored beforre April, and the number of flights between London and Cornwall will be doubled from tomorrow. But the company has denied a BBC report which claimed that the former Southern main line through Dartmoor via Okehampton and Tavistock had been selected for reopening, providing an inland alternative between Exeter and Plymouth. A Network Rail source commented to Railnews: "I think there have been a few assumptions here, and they are not true. In a statement about the former Southern line, Network Rail said: "It was closed in the 1960s and the land was sold off and built on. It would require substantial engineering, including new bridges and viaducts, before a new line could be constructed. Timewarp Taunton Trip  There was a smattering of vehicles in "Taunton" livery in the town centre; but, frankly, the overall picture was disappointing. Tunnel Boring Machine out of Lego! There is a modern rule that any large engineering project has to involve Lego at some point, and Crossrail have finally complied with Regulation 17 subclause 13a of the Lego Engineering Act 2008. Aberystwyth: Arguably the capital of Welsh culture, Aberystwyth's bus scene has changed dramatically since these views were taken in May of last year with Arriva having finally closed its much-reduced South Cambrian division and retreated to running no further south than Porthmadog. With reference to the former Southern Region rail route from Network rail. I feel this route would be ideal as a diversionary route (not as a regular mainline), this line could then be used by local trains normally but provide resilliance in times of stormy weather. Surely the viaducts would not need to be replaced? In the Scottish border they are opening the borders line that goes over several viaducts which were closed by Beeching and they haven't needed new viaducts. The former Souther Line needs 12 miles of former trackbed to be reacquired between Meldon and Tavistock/Bere Alston, this can be done by compulsory purchase orders including the council offices in Tavistock and a few houses which were built on the line!! This route has a dual benefit, Plymouth and Cornwall gets a diversionary line when Dawlish is closed and the second benefit is that railway is brought to one of the biggest towns in England (Tavistock) that isn't served by rail and Okehampton which is a big town and will provide commuter routes. Looks very smart - great to see them working hard to get everything up and running again so quickly following another tragic fire. These Darts in the latest livery look superb. As do the Mercs in the latest livery. And I love the logo too. i agree they look great in new livery. i heard first are to take delivery of more buses and starting new route in plympton called red route, red livery which is odd but i spose no more wierd than go ahead plymouth haveing blue livery in tavi. if you think about it its clever marketing, confuse passengers gaining bums on seats. omg! a positive comment from mr furse! he must be feeling ill!